Slate Pro Audio is the professional recording and audio equipment manufacturing division of an American company called Yellow Matter Entertainment, which has apparently been providing a variety of services to the US entertainment industry for the last four years or so. The Dragon compressor is the company's first hardware product, the brain‑child of Steven Slate, the eponymous company's principal, and while it has hints of the Empirical Labs Distressor and the Urei 1176 in its design ethos and sound character, it is a long way from being any kind of copy‑cat. This product has several unique aspects and an almost chameleon‑like ability to change its sonic character at the touch of a few controls and switches! Although it's a single channel device, two units can be coupled easily for stereo-bus working. The 2U, rack‑mounting Dragon is painted black, with black knobs and black bezels around the silver toggle switches. The only splash of colour is the large rectangular VU meter on the right-hand side! However, it's nothing like as dull-looking as that description makes it sound, thanks to a subtle black dragon motif embedded in the surface treatment. In some lights this relief is almost invisible, while in others it is revealed more clearly — but it always looks interesting and eye‑catching... and expensive. The solidly built steel chassis extends about 220mm behind the rack ears and weighs in at around 5.5kg (12lbs). An internal metal screen runs front to back to separate the linear power‑supply section on the right and the audio electronics on the left. The latter are almost all accommodated on a single large circuit board mounted in the base of the unit, with a second, smaller vertical card behind the front panel to mount all the controls and a few circuit elements. Both the input and output rear‑panel audio connections are duplicated on XLR and TRS quarter‑inch sockets, while a further pair of TRS sockets provides a stereo link. This is an unusual arrangement, with separate sockets for the link‑out and link‑in side‑chain signals, requiring two cables to couple a pair of Dragons (as opposed to the more common single-cable, bussed control‑signal arrangement used by most other compressors). Mains power is connected via the usual IEC inlet with a 220/110V AC voltage selector and integral fuse‑holder. The audio input and output are both transformer‑balanced using American‑made Altran transformers (a C4330 model for the input, contained in a mu‑metal can, and a C4000 gapped‑core output transformer). The output stage is driven as class-A, using the venerable 2N3055 output transistor. The core of the compressor circuit is a fairly classic discrete FET‑based design, but all the supporting circuitry comprises very high-quality Burr‑Brown OPA2604 and Texas NE5532 op‑amps. The electronics design is actually the work of Tim Caswell from Studio Electronics (and Caswell Amplification) — another boutique US manufacturer — working to fulfil the concept and specification brief that Steven Slate originally devised. Apparently, the basic idea in developing the circuit design for the Dragon was to combine the very musical‑sounding FET compression characteristics of an 1176 with the extraordinary tonal versatility of the Distressor. So the Dragon expands the normal compressor/limiter function with some interesting and creative tone-shaping options that go a surprisingly long way towards tape‑saturation emulation too! The rear panel of the Dragon. As well as the XLR and jack I/O, there are two TRS jacks that allow two of these mono compressors to be linked for stereo operation. The front‑panel controls are a combination of the familiar and the unexpected. This is a fixed-threshold device, so the amount of compression is determined by the input signal level, set with the first rotary control on the left-hand side (scaled simply from 0 to 10). A bypass toggle switch is also provided, to make it easy to compare the processed and original sound. Next along is the Compression control, which is a six‑way rotary switch adjusting the ratio from 1:1 (actually marked Ø), through 2:1, 4:1, 8:1 and 12:1 to 20:1. Beneath this control, another toggle marked 'Squash' emulates the infamous 'four‑buttons‑in' operation of the original Urei 1176. This mode famously produces a very characteristic, punchy sound with significant distortion artifacts (caused by the resulting mis‑biasing of the original circuitry). Whereas the Urei operated with a ratio of somewhere between 12:1 and 20:1 when forced into the four‑button mode, the Dragon retains whatever ratio has been dialled in on the Compression control — so selecting 20:1 probably gives the closest emulation of that popular 1176 sound. A pair of smaller knobs, one above the other, adjusts the Attack and Release time constants, both labelled simply Fast and Slow at the control extremes. The specifications claim that the attack control spans 20 to 800µs, while the release is 50ms to 1.1 seconds. There is no auto‑recovery mode. Next along is a large Output level control, which does as you might expect and is scaled, again, just 0-10. However, not only does this allow make-up gain to be introduced, it also affects the amount of the saturation effect when this mode is active (more on this in a moment). Below the rotary control, another toggle switch engages the stereo Link function via the unusual dual rear-panel sockets described above. Almost the last control for the compressor functions is a switchable high‑pass filter in the side‑chain, to make compression amount less reactive to bass‑heavy material. Settings comprise off, 80, 100, 120, 160, and 200Hz: an unusually flexible set of options that permits usefully precise control. That's almost all of the compressor's controls done and dusted, with half the front panel still to go! Most of the rest of the controls are associated with interesting tonal shaping, starting with four toggle switches labelled Vintage, Sheen, Bite and Boom — all of which affect the sound even if the Compression ratio control is set to off (Ø). The Vintage switch reconfigures the circuitry to provide a fairly aggressive, harmonically‑enhanced sound character, although the actual sonic properties are quite dependent on the Attack and Release control settings. Sheen is intended to tailor the sound to be reminiscent of a typical opto‑compressor, with a bright high end almost regardless of the amount of gain reduction. As you might expect, the Bite control adds an upper‑mid forwardness, to make the sound more immediate and up‑front, while the Boom switch puts a sub‑harmonic boost in at the very bottom end (below 80Hz), to add weight and stature to the sound. A four‑way rotary switch labelled Saturate is next in the enhancement section, labelled simply 0-3, the first setting being off, and the last a pretty heavy saturation distortion effect, with the intermediate settings providing progressive levels of saturation. This feature offers everything from subtle warmth and gentle harmonic richness — not dissimilar to a kind of tape overdrive effect — through to full‑on, thick, edgy distortion. As I mentioned earlier, the strength of the saturation is affected by the output level control too, not just the rotary switch settings, so there is a wide degree of user controllability here. Another unusual control to find on a compressor is a rotary Mix control, ranging from 100 percent wet to 100 percent dry — with a toggle switch to activate the control. Not only does this feature make it incredibly easy to create parallel compression effects, but it can also be used to dilute some of the other tonal shaping effects provided, maximising the range of creative control on offer in the Dragon. Finally, the large backlit VU meter can be assigned to show gain reduction or output level, using a pair of toggle switches, with the output level 0VU point being set for either +4 or +8dBu (the latter making it much easier to judge the signal levels when working with deliberately hot material). The Dragon is quite an unusual compressor because it offers so much in the way of additional tonal variation and saturation effects compared to most conventional units. With the Vintage, Sheen, Bite and Boom sound-mode switches, the Dragon can be set up with ease to provide anything from really quite crisp and sharp-sounding dynamic control on the one hand, right through to dark, warm and organic characters on the other — plus pretty much everything else in between. The mode switches all live up to their names very well too. Boom does indeed fill out that bottom end (although you'll need full-range monitors and a good room to really appreciate the magic going on in the bottom octave) and Vintage brings that harmonic complexity associated with transformers and valves. Sheen really does smooth out the top end in a classic vintage opto‑comp way, while Bite introduces an edge that really helps the source cut through. The saturation control does what it says, too, going a long way towards an overdriven tape kind of sound — with nicely squashed transients and a useful lower‑mid thickening effect. The fact that you can still use the saturation effect with the compression turned off by setting the ratio to unity 1:1 (zero on the panel markings) provides even more flexibility, allowing the Dragon to function as a mix processor as well as a dynamics controller — although a stereo version would make life easier. I've already mentioned the Dragon's ability to provide a very passable rendition of the 1176, but it also makes a good stab at providing the character of other solid‑state Urei compressors,such as the fast and bright LA3A. A touch of saturation in Sheen mode, with fairly fast attack and release times, delivers a surprisingly similar sound that works really well. Flip in the Bite switch, too, and drive the compressor into more gain reduction to get a really crisp, in‑your‑face sound on hard male vocals. For me, the most useful control on the whole machine is the Mix knob. Not only does this provide instant parallel compression options, it also allows the complete compression/tonal tweakery effect to be diluted to taste, preserving much of the transparency and detail of the source material regardless of how heavy‑handed you get with the compression and mode switches. It's surprising what a difference just backing off the Mix control a little makes to the overall sound, maintaining the dynamic control and character while also preserving the source sound quality nicely. A lot of compressors tend to dull the sound a little — but that's not the case here, and the Mix control allows you to find the ideal balance with ease. I like the Dragon very much, and mostly because it's such a well‑conceived and versatile-sounding unit. It takes a little time to get to know and understand the full range of options on offer, and there are a few extreme setting combinations that may be of limited value (anything involving the maximum saturation, for example), but the wide range is what makes this unit so flexible. A stereo version would be great for mix-bus applications, but you can link two standard units if the budget allows. If you're struggling to decide between a Distressor, an 1176 and an LA3A, the Dragon might be the solution — and it's certainly worthy of extended auditioning if you're looking for some real analogue character in a new dynamics controller. The UK retail price of the Dragon places it amongst a lot of very serious competitors — many of which offer two channels rather than just one, too — but there are few devices that can match its sonic versatility. 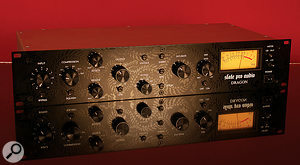 Short-list options for single-channel alternatives could include the interesting ADL 1000 tube compressor‑limiter, the characterful Chandler Germanium or LTD2 units, the Universal Audio 1176 LN or LA3A and the Empirical Labs Distressor EL8 (both with some change to spare over the Dragon). Squeezing the budget a little harder brings the original Neve 2254 into reach too. Extraordinary tonal variation at the flick of a few switches. Easy to use and abuse! It does crisp and bright as easily as dark and rich. The Mix control enables precise control of sound character and also means that a parallel compression mode is effectively built in. It's relatively expensive for a mono unit. A very unusual single‑channel compressor, with more tonal variation options than pretty much any other compressor on the market. 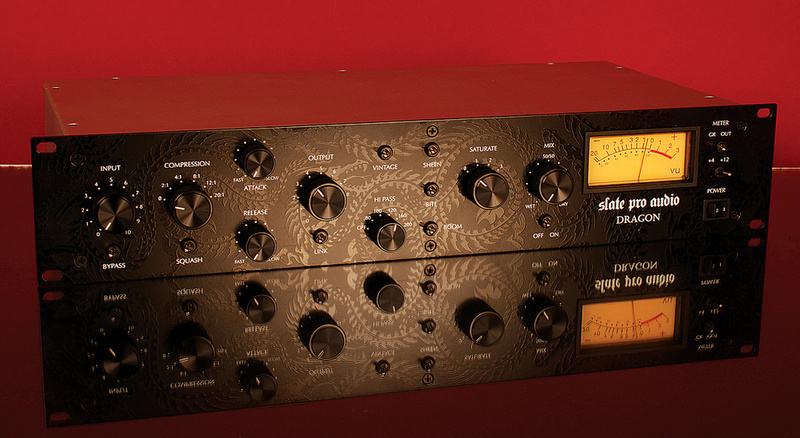 The Dragon is something of a chameleon, in that it can provide passable emulations of many popular solid‑state compressors, as well as a wide range of its own unique characters, including some useful tape‑saturation‑like effects. Studio Xchange +44 (0)1462 677333. Slate Pro Audio +1 323 656 2050.